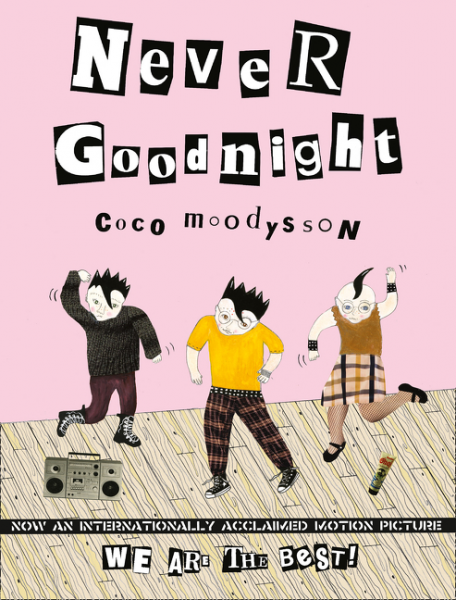 Coco Moodysson’s Never Goodnight, the 2008 Swedish graphic novel that inspired the film We Are The Best! (directed by the author’s husband Lukas Moodysson), is now available in English for the first time. 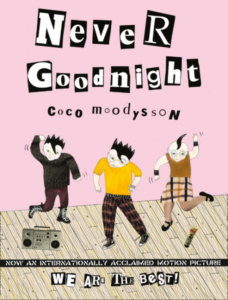 Informed by the author’s personal experience of punk rock girlhood in early 1980’s Stockholm, Never Goodnight is a deliciously nostalgic ode to preadolescent angst, fun, and music. Coco, Klara and Matilde meet as kids in folk-dancing class where they improvise political theater. They are awkward, ostracized by their classmates, and are sure of nothing save that they are ugly and unlikeable. But when Matilde’s older sister lends them her vinyl recording of London Calling by The Clash, they are ecstatic. Their shared love of punk becomes the basis of their friendship and a point of pride. They find purpose and identity in the struggle to form their own band and to rub their success in everyone else’s faces. That none of them have ever played an instrument, or even have the means to purchase one, is the least of their problems. Their kooky, oft-absent parents allow them plenty of practice time at the local youth center (not to mention tolerate a fair share of yelling and pot-banging at home), but there they encounter hostility from older, more practiced male rock bands. Even the well-meaning guys who run the practice space and intervene in their disputes just don’t get it. They try to mold the girls’ sound — “THIS is what it should sound like!” — and encourage them to perform live because “people want to see a girl band,” completely unaware that their gender-as-genre attitude and offer of help are both offensive and condescending to the young musicians. They enact the requisite sighing and eye-rolling, but they refuse to cater to others’ attitudes. They have bigger things to worry about, like stage fright. And though such attitudes begin to manifest as internal doubt that they’ll ever be “good enough” (a feeling many professional musicians and women working in music have publicly struggled against), their indignation is never fully dispensed with. The artwork itself is as bold yet resistant to form as its subjects. Bathroom haircuts are shown as spike-topped, ink-filled shapes that fall across oddly shaped heads and androgynous faces. Neckless, chinless profiles give them all a slightly rounded, insect-like countenance. The girls look as strange as they feel, but not, in comparison to everyone else, as strange as they think they do. They look the way a lot of us might remember feeling at their age: ungainly and misshapen. While the movie We Are The Best! does wonderfully portray Coco, Klara and Matilde in all their awkward glory, it comes off as sweet: a bit cringe-worthy and pitiful at times but completely relatable. The actresses are undeniably cute with their weird haircuts and ambiguous gender presentation. One nuance that doesn’t quite translate from page to screen is the slightly frenetic, nervous energy depicted in the drawn detail lines around their eyes and mouths when eating, sweating, or gritting their teeth. Sometimes they are cute and sometimes they really might not be, and so what if they aren’t? That the characters’ looks change and warp somewhat in Never Goodnight gives greater import to the defiance of expectation that they come to enjoy. Moodysson so accurately nails the conflicting tones of preteen anxiety and exuberance that even the sweetly childish games the girls play — innocently with yarn, tepidly with boys, recklessly with their first tastes of alcohol — may be read as personal and somewhat embarrassing. So too might their first stabs at asserting political agency, or their uninformed and circular debates about what is and is not punk. It is somehow painful to acknowledge that we were all once that earnest. But that is what makes Never Goodnight so compelling. Moodysson’s characters are self-reflective and critical enough that our judgments of them are their own. It’s a hall-of-mirrors effect that causes the reader to question how much we continue to practice self-judgment, whether past or present. Most of us can remember feeling the way Moodysson’s characters do: helpless to control our surroundings, eager to identify ourselves through exclusion, invisible to the objects of our desire, and jealous of our friends. They should also remind us of the first time we were brave, took a risk, and liked who we were. Hopefully, however, the thing the reader relates to most is the absolute and infinite love that we had of our first favorite band and of those who loved them too, even though — or especially because — they only knew three chords.